Paintings that trade more frequently exhibit higher returns, thereby biasing estimates of asset class returns at commonly used measurement intervals (see the chart below). Correcting for this selection bias reduces the average annual gross return across all paintings in the sample from 10% to 6.5%, and the gross annual Sharpe ratio from 0.24 to 0.04 during 1972 through 2010. The correlation of returns with world equities remains about 0.32. Based on uncorrected (biased) statistics, a mean-variance investor would allocate about as much to art as to stocks and achieve a gross annual portfolio Sharpe ratio of 0.31 (17% higher than the 0.26 for stocks alone). After correcting for bias, a mean-variance investor would allocate essentially zero to art. Allocating equal weight to art and stocks would actually reduce Sharpe ratio by 18%. Accounting for high trading frictions, costs of insurance and physical security and risk of forgeries further weakens the case for art as an investment. Non-monetary enjoyment of art is mitigating. 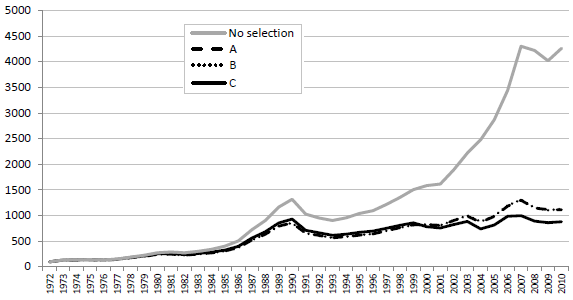 The following chart, taken from the paper, shows the effect of correcting for selection bias on a gross price index for all paintings in the sample, normalized to a value of 100 in 1972. The uncorrected (No selection) index exhibits relatively strong growth over the sample period. Correcting for selection bias in three ways (Models A, B and C) substantially lowers index performance. Bias derives from the fact that frequently traded paintings appreciate more strongly than those that seldom trade. An investor unable to identify at purchase paintings that will appreciate strongly (frequently trade) is likely to experience the corrected gross appreciation. In summary, evidence indicates that, after correcting for selection bias due to concentration of appreciation in frequently traded items, paintings are unlikely to be a good investment or (because of poor return) an effective diversifier for stocks. As noted in the paper, the authors do not account for costs of trading and (prudently) owning art in estimating returns. The study does not address ways of identifying art with strong future price appreciation (are that may trade frequently in the future).